Finely textured and very tender, this is the perfect version of the Scottish cookie. Many recipes include some kind of starch that contributes, along with butter, to the "shortness" of the dough, which is where these cookies get their melt-in-the-mouth texture. Potato starch, cornstarch and rice flour are among the possibilities. Rice flour gives a bit more crunch, while cornstarch is the softest of all, making a particularly short and flaky cookie. If my butter hasn't softened in time, I put the cold butter into a saucepan and melt a portion of it. Then I mix the rest of the butter into the melted butter to get the very soft consistency I need. Just make sure that you don't let too much of the butter melt. Preheat oven to 325 degrees F/160 degrees C. Butter a 6-by-10-inch glass baking dish. Place the butter in a mixing bowl. The butter must be very soft-the consistency of mayonnaise or whipped cream. Add the salt to the butter and mix well with a wooden spoon or whisk so that it dissolves completely before you add the rest of the ingredients. Sift the flour and cornstarch together into a bowl. Add the granulated sugar to the butter and mix just until combined. Add the flour mixture and mix just until a smooth dough forms. Pat the dough evenly into the prepared baking dish. The dough should be no more than 2/3-inch deep. Bake until the top and bottom are lightly browned, about 30 minutes. The middle of the shortbread should remain light. Let cool on a wire rack until warm to the touch. Sprinkle the shortbread with the superfine or granulated sugar. Tilt the dish so that the sugar fully and evenly coats the surface and then tip out the excess sugar. 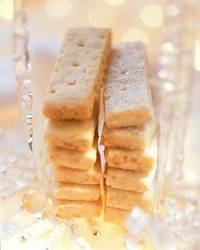 With a very thin, sharp knife, cut the shortbread into rectangular fingers about 1/2-inch wide and 2 inches long. If the cookies have become cold they will not slice well, so they must still be warm to the touch at this point. Chill thoroughly before removing from the baking dish. The first cookie is difficult to remove, but the rest should come out easily with the aid of a small, thin offset spatula. The cookies will keep in an airtight container in a cool place for up to 2 weeks. Makes one 6-x 10-inch pan of shortbread fingers. Source: Tartine, by Elisabeth M. Prueitt and Chad Robertson, (Chronicle Books, 2006). I havent tried these yet, but they look delicious.